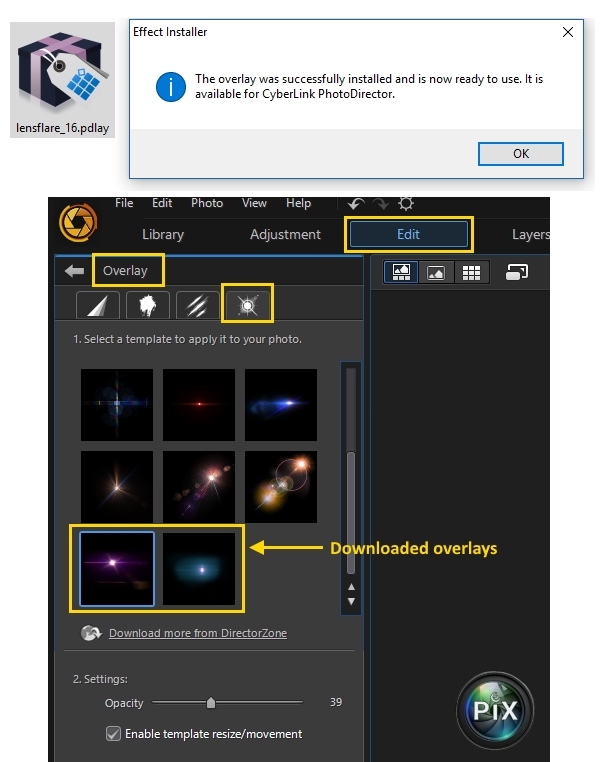 downloading overlays from directorzone - help? Welcome to the DirectorZone forum! Whether you download & install directly from DirectorZone or from within PhD8, your downloaded overlays will appear in the same place. In PhD8, under Edit > Overlay, there are 4 categories: 1. Light Leak 2. Grunge 3. Scratch 4. Lens Flare. Some overlays come pre-installed. Hi PIX - I sucessfully dld the 'Album' template ... but I can't seem to find it ?!?!? I looked in the transitions, templates, particle, and fx 'rooms' and can't seem to locate it (PD13). Weird... once I dld it - where does a template usually show up? I haven't dld one for a while as you can guess. Quote Hi PIX - I sucessfully dld the 'Album' template ... but I can't seem to find it ?!?!? I looked in the transitions, templates, particle, and fx 'rooms' and can't seem to locate it (PD13). Weird... once I dld it - where does a template usually show up? I haven't dld one for a while as you can guess. If all goes well with DirectorZone downloads & installation, you should find your downloaded template in the appropriate module of the software. In your case, CS, you've installed the Album template which is a Magic Style template. You should find it in Magic Style & Magic Movie Wizard, neither of which are listed alphabetically for some obscure reason. Look for "Modern Album" near the bottom of the list. Thanks for the response. I have not used Magic Movie Wizard before - found it under the 'Edit' tab across the top of the home page of the PD13 editor. I thought the template would end up in one fo the effects rooms or somewhere like that. O well. NOt sure I'll use this template as I'm not sure if I have controll over how to modifly it or not. Well, at least I learned where Magic Movie Wizard is located. THanks again.